I, um, have another gluten free chocolate cake recipe for you. If you’ve been following my gluten free cakes for decorating series, you might be thinking, geez, can she not bake any gluten free cakes that aren’t chocolate?! I can! And I will share some! It was fully my intention to post something really different this time. But then, I had this thing where… ok basically I really felt like chocolate cake. And my whims tend to translate into blog posts. And this cake is so much more than just a chocolate cake. It’s a gluten free toasted almond chocolate cake. 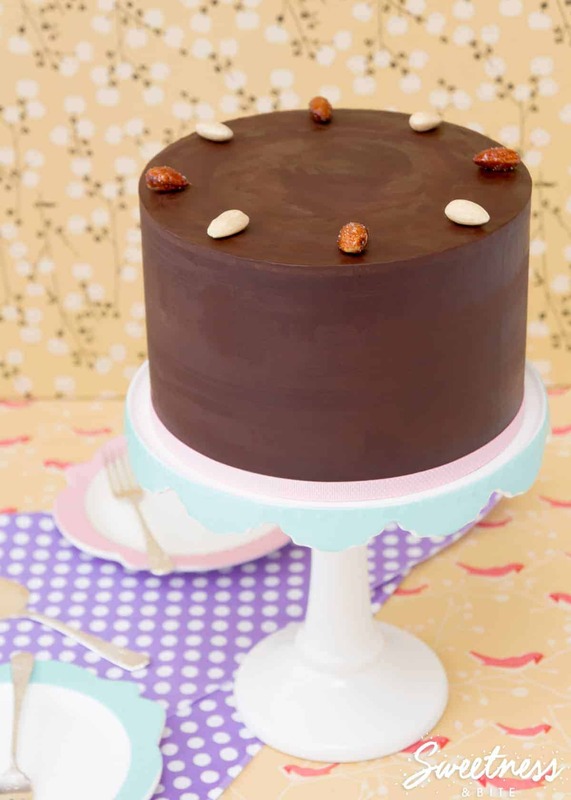 A simple but effective twist on my devil’s food cake recipe, this gorgeous cake has lightly toasted ground almonds and a splash of Amaretto liqueur, and is filled with almond-studded dark chocolate ganache. See why I just NEEDED it?! 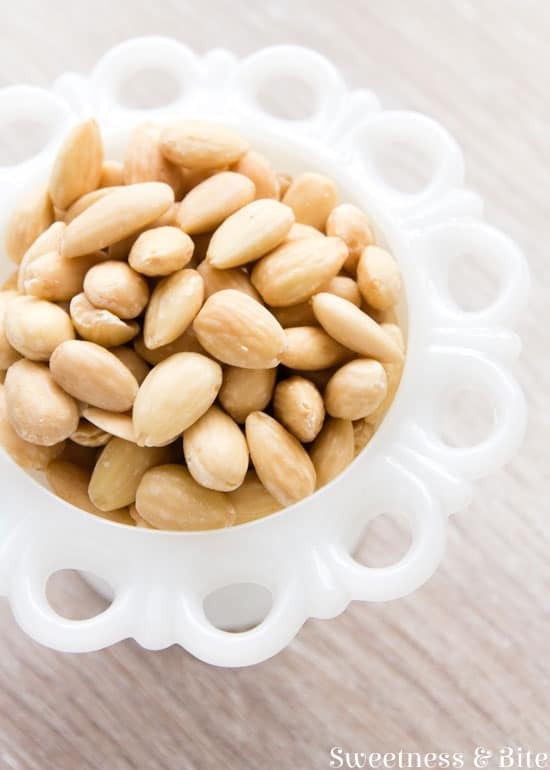 The almond is a nutritionally dense food and is a rich source of vitamin E, containing 26 mg per 100 g. They are also rich in dietary fiber, B vitamins, essential minerals such as magnesium, copper, manganese, calcium, and potassium, as well as monounsaturated fats and polyunsaturated fats, which potentially may lower LDL cholesterol. So, I basically just turned this chocolate cake into a health food. I used almonds in two forms in this cake, blanched whole almonds are chopped and used in the filling, and ground almonds take the place of a little of the flour in the cake itself, making the cake even lighter and adding more moisture. And for extra flavour, they all get toasted. Toasting the ground almonds gives the most amazing deep, rich toasty/nutty flavour to the cake layers. It’s another added step, of course, but it really is worth the extra couple of minutes for the depth of flavour that it gives finished cake. You can definitely leave the almonds untoasted, the texture of the cake won’t be affected, but if you have the time to spare, then I promise you the time is worth it. See that slight golden colour they get? Colour is flavour, people! This is part of my Gluten Free Cakes For Decorating series, so lets talk a little about what decorating creations it’s suited for. This cake is slightly more delicate than my regular gluten free devil’s food cake, which basically means you wouldn’t want to try carving it, unless you want to end up with more crumbs than cake. But it will work perfectly as a regular single or multi tiered cake, when filled with ganache or buttercream, and covered in fondant. And it gets better after a couple of days, so the three or four day decorating timeline (bake/ganache/fondant/decorate) works really well. 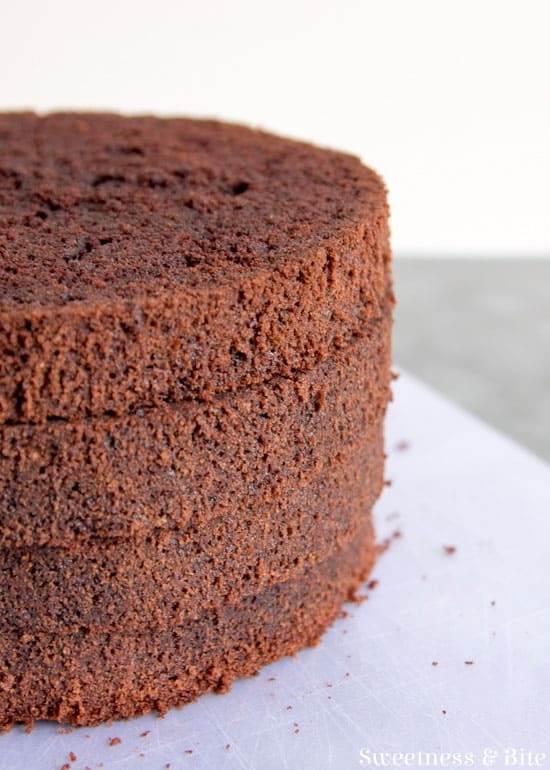 I chose to fill (and cover) these gorgeous layers with dark chocolate ganache, but it would be just as delicious with a light, fluffy meringue buttercream. 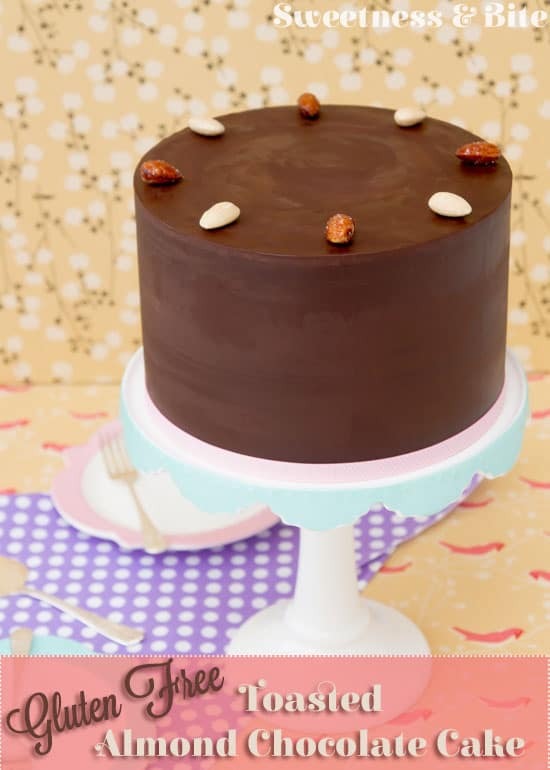 If you’re not covering the cake in fondant, then a few whole plain roasted and/or honey roasted almonds make a perfect and simple decoration. I don’t know how many times I have said (to myself, and to other actual people in real conversations) that devil’s food cake is my favourite ever cake. But y’know, this version may well be even better. 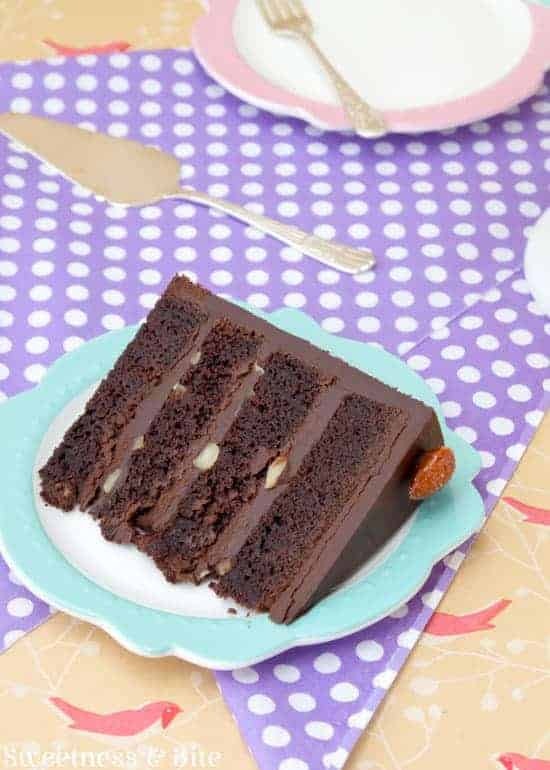 A gorgeous, rich chocolate cake with lightly toasted ground almonds and a splash of Amaretto liqueur, filled with almond-studded dark chocolate ganache. Preheat oven to 160°C. Grease and line a deep 7” round baking tin, and make a foil lid. 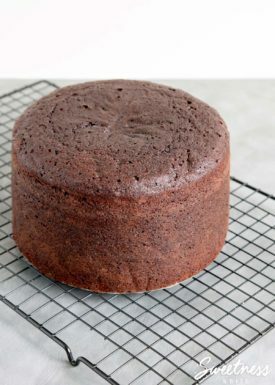 This makes a tall cake, so make sure your tin is at least 3" tall, alternatively, you can bake it in two shorter tins - just make sure you reduce the baking time. Toast the ground almonds in a small pan over medium heat, just until they are very lightly golden and smell gorgeous. Tip it out into a small bowl and leave to cool. Chop the chocolate and place it in a medium-sized heatproof jug with the Amaretto. Pour over the just-boiled water and leave for a few minutes for the chocolate to melt. Whisk until smooth. and leave to cool. Sift the flour, cocoa, baking soda and xanthan gum into a medium bowl. Add the cooled toasted ground almonds and whisk to combine well. Beat together the butter, caster sugar, brown sugar and vanilla on medium-high speed until very light and fluffy. Use a stand mixer if you have one, or a hand-held mixer and a large bowl will do. Whisk the eggs together in a small jug or bowl, and add them gradually to the butter and sugar, beating well between additions. Turn the mixer down to low speed and add the flour mixture and the chocolate mixture alternately, beating briefly between additions. Scrape down the sides of the bowl and add the sour cream, and beat on low speed until combined. Pour into the prepared tin, cover with the foil lid and bake for 1 hour 15 minutes to 1 hour 30 minutes, or until a skewer inserted into the middle of the cake comes out clean. 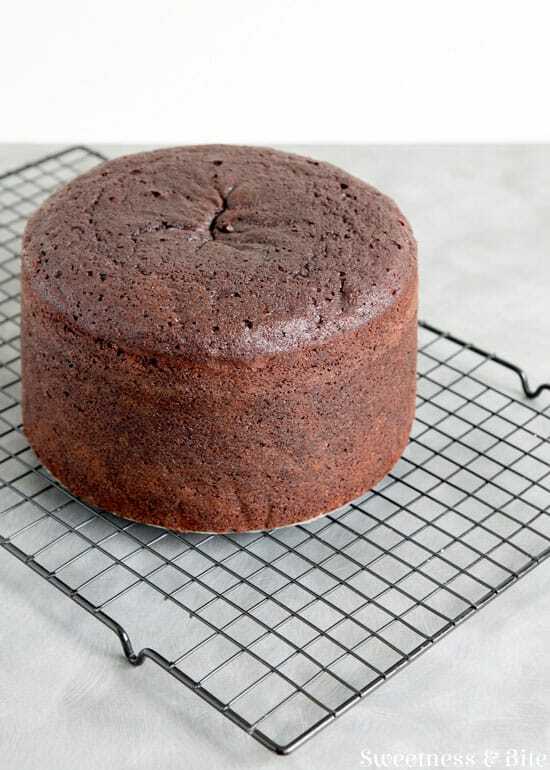 Allow the cake to cool for an hour, then cover the tin with foil and leave the cake to cool completely in the tin overnight. Heat the cream in a medium saucepan over medium-high heat, just until the cream begins to boil. Remove from the heat, stir in the Amaretto. Add the chopped chocolate, gently shimmy the pan until the chocolate is covered by the cream, then leave it for several minutes. Slowly and gently stir until the chocolate and cream combine. 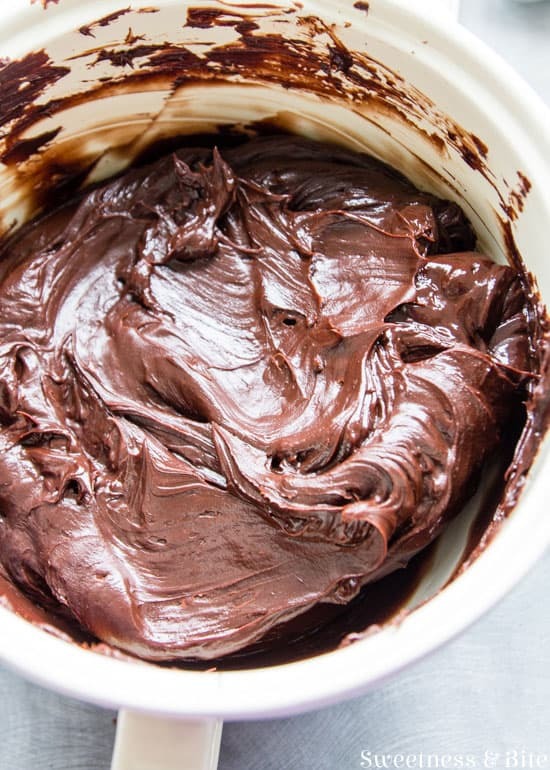 If there are still unmelted pieces of chocolate, return the pan to a very low heat, and stir constantly until the chocolate is fully melted and the ganache is smooth. Pour the ganache into a large bowl and leave to cool. Once cool, cover with plastic wrap and leave the ganache to set overnight. Split the cake into four even layers. Gently heat the ganache in the microwave until it softens to the consistency of peanut butter. 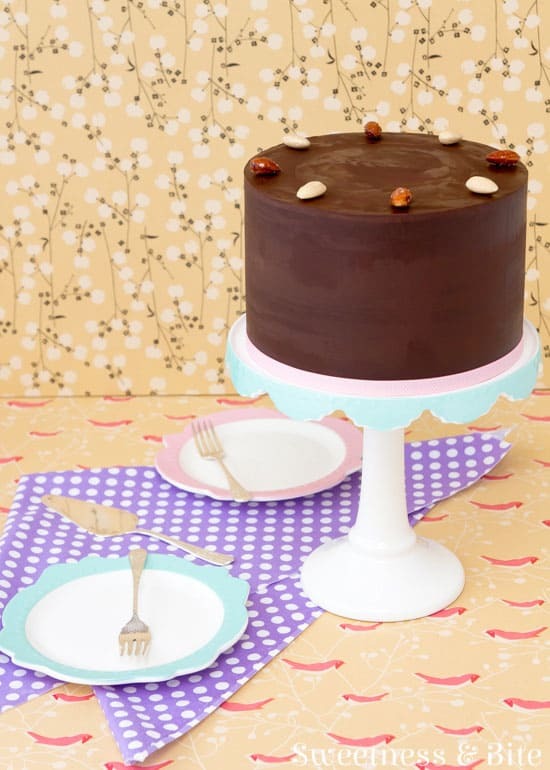 Spread some ganache onto the first layer of cake, sprinkle with 1/3 of the almonds. Place the next layer of cake on top, press down gently, then continue stacking the cake layers with ganache and almonds. Ganache the outside of the cake. If covering with fondant, leave the ganache overnight to set. 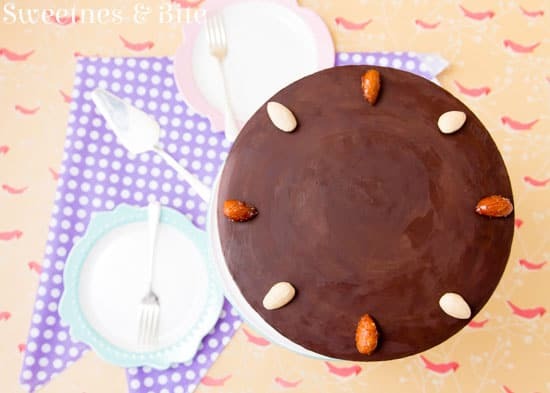 Or, decorate the cake with some whole, roasted almonds (I also used some honey roasted almonds). Love the sound of this cake but don't need it to be gluten free? 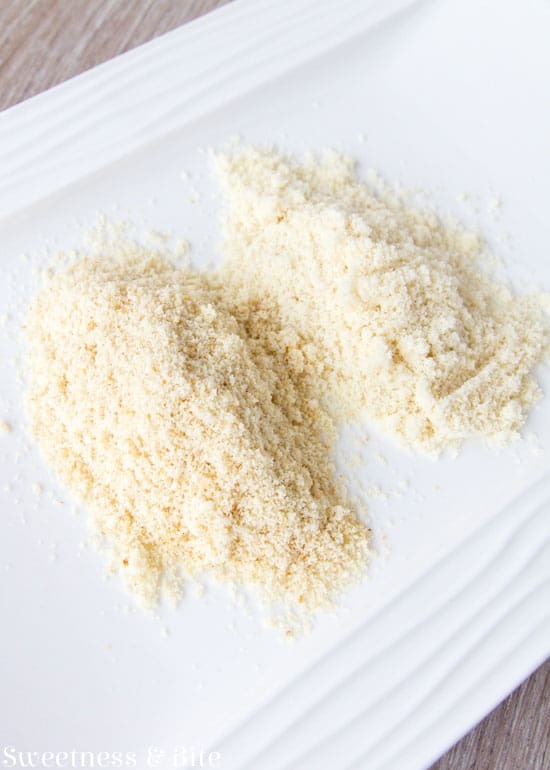 Simply substitute the gluten free flours for regular all-purpose wheat flour and leave out the xanthan gum. If you prefer not to use alcohol in your cakes, or can't find Amaretto liqueur, simply omit it from the recipe. I have a relatively big event coming up, and was thinking of making a variation of this cake in rather large amounts. Would it make sense to create the cake layers up front, so all I need to do is assemble/decorate them the day of the event? Have you frozen them before? Hi Liz, I’m so glad you love the recipe! You can definitely freeze it, it may get a little bit denser after it’s been frozen, and it should be a bit more moist (never a bad thing!). Just make sure you wrap it really well in plastic wrap and put it in an airtight container before you pop it in the freezer, and leave it still wrapped until it has completely defrosted. 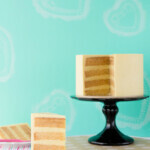 To speed up the thawing you could split the cake into layers and wrap the layers separately to freeze. Also means that splitting it is one less thing you have to do when you’re putting it all together. 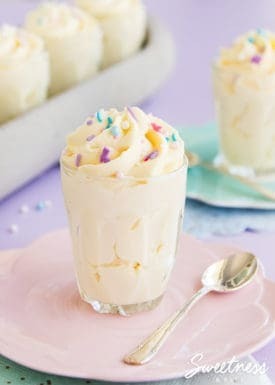 Hi Natalie, I would like to make this recipe and I was wondering if would be possible to bake the recipe in 2 cake tins of 7″ round instead of one. Then the baking time should be cut to half and would be more easy to cut the layers, right? what do you think? is it a good idea or not? Thanks in advance. 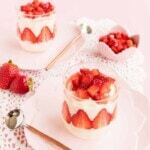 I love your recipes :-). Cheers, Victoria. Hi Victoria. Absolutely, you can bake it in two pans, and I often do. The only difference is that it you’re trimming the tops then you will have two tops to trim rather than one, so you could end up with a slightly shorter cake. But I think they often rise a little bit better in the two pans, so the difference in height is probably negligible in the end! ohh, yes! you are right about trimming the tops but I think the eight of the whole cake in the end will be fine 🙂 anyway. Besides I love to eat the top of the cakes when leveling ;-), it is the best part to me and nobody see me doing that, hehehehe. Let you know about the result. Thanks Natalie. Cheers. I want to try however I don’t have any xanthan gum lying around. I am assuming this is to replace baking powder so that it is completely gluten free? 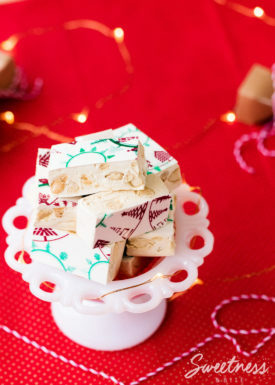 Have you tried this recipe without it before and what was the result? Hi An 🙂 Xanthan gum is used in gluten free baking to replace the gluten that is present in wheat flour. The gum helps to bind the cake crumb and assist the structure of the cake as it rises. You can try and make the recipe without it, but it would most likely be very crumbly and may fall apart as you cut it. 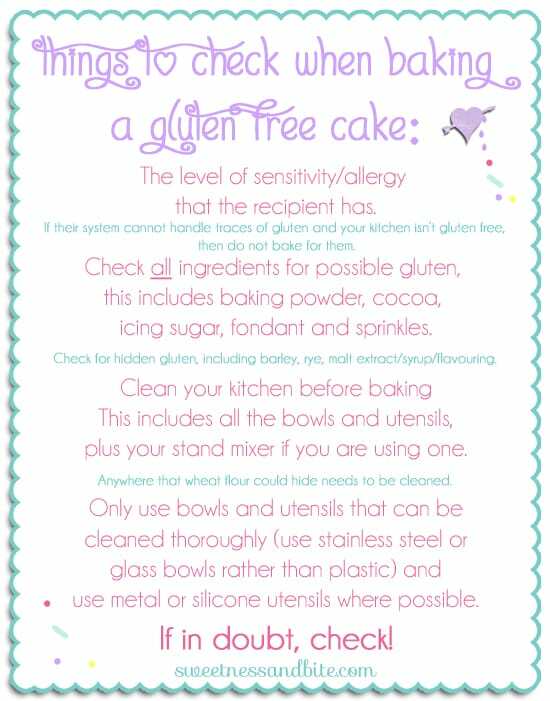 Some people prefer not to use xanthan gum in their gluten free baking and get along fine without it, but I find it necessary in my cake recipes, as these are designed to be used for cake decorating and so I don’t want them to crumble. PS: Love your “How to ganache a cake” tutorial. So many things to learn and try out. Hi Nadia, thank you for your lovely words 🙂 Yes, you absolutely can substitute regular wheat flour for the gluten free flours and leave out the xanthan gum. The cake works equally well with gluten as it does without. Good luck, and I hope you love it! Hi Natalie, Today is the day: I am going to bake the cake! 🙂 One final question. 160°C – is that fan forced or normal top/bottom heat? I have seen that some recipe specify which kind of heat is required. Thank you so much. I’ll definitely let you know how the cake turned out. I’m very excited. Thanks! Hi Nadia, hopefully I’m not too late with this, but I prefer non-fan forced, with top and bottom heat for cakes. Fan forced seems to dry out the crust a bit in our oven. Thank you for your reply. I live in Germany so we both only have a small time frame in which we can communicate 🙂 But first things first: The cake turned out great but had a few surprises in store…which leads me to my question: How deep are the baking tins in New Zealand? I used a 20 cm round tin, appr. 7.8 inches and it is 6 cm high, appr. 2.3 inches. So when I filled in the cake mixture I was thinking “Wow! !” as the mixture was literally only just under the rim. But the tin was packed in its little space suit, so on went the foil helmet and into outer space it went. I baked it 160°C fan forced as I had read somewhere that fan forced is about 20°C less than top/bottom heat. So 180°C top/bottom seemed a lot and equally 140°C fan forced seemed too low. As the cake was covered I wasn’t too worried about the top drying out. After 1 h 15 min I checked the cake. Wow, it had risen big time, about 3 cm (1,2 inches) over the rim. The skewer came out wet! So I took off the lid and baked the cake for another 15 min. The skewer was not so wet anymore, but the top a bit crispy so I put the lid on again and baked for another 15 minutes. The cake had unfortunately dropped in the middle, probably after the first time I had opened the oven. After it had cooled sufficiently I cut off the top and I still have a 6 cm high cake which I can cut into 3 layers which is great. My husband and I devoured the top layer. Mmm, so yummy! Moist, chocolately and the smell and taste of almonds. Fantastic! Next time I’ll either bake the cake in a bigger tin, 24 cm or I won’t use the entire mixture for the cake, but will put some aside for cupcakes. I baked it using normal wheat flour and w/o the gum trag. I’ll post a picture of the cut cake on your FB page if I may. 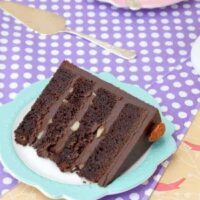 Look forward to hearing from you and this recipe will definitely be on my top list of chocolate cakes. Thank you so much for sharing. Hi Nadia. The tin I use is about 3″ tall, so I guess just a wee bit taller than yours. I might add that into the recipe, I forget that some tins aren’t so tall, the 3″ ones are basically all we get here! 160°C fan forced definitely sounds like the best option for your oven, and you know I think next time you could probably do it without the baking strips, just line the tin with the baking paper nice and high, and do the foil lid on the top. This cake is really good in that it doesn’t generally get much of a crust on the edges, so you can definitely do it without the strips. That will help it cook a bit faster too since the strips slow down the baking. And the foil lid will still protect the top and get it to rise nice and evenly. The batter does make really awesome cupcakes too if you do decide to use some for that, they don’t dry out as fast as some other cupcakes can, they’re still lovely and moist even a couple of days later. I’m so glad you and your husband loved the flavour, I have to say it’s possibly my favourite cake flavour (although choosing a favourite is like choosing a favourite kid!) I just love almonds and chocolate together. Oh and yes please, I would absolutely love to see a picture! Just a question, is the baking soda you use for this recipe called Bi-carb soda or baking powder? What could i use instead of refined sugar? Any healthier alternatives? comerciales de la comarca del Almeriense. Please can I substitute the sour cream with yogurt?cause we dont have sour cream in nigeria. Look so yummy! I would try this recipe for sure.Thanks for sharing with us. Can you convert the recipe to American cups and ounces etc for me? I’m finding it hard to convert each ingredient. Thank you so much!! I want to make this recipe this week! Of the ingredients I can check, most of them are very roughly close if you’re using NZ/Australian standard cups, although if you’re using US cups then the water measurement would be closer to 1 cup than 3/4 (215ml = .90 cup) and the brown sugar would be 1 cup not 1 1/4 (different countries use different standard cup measurements, here in NZ a standard cup is 250ml, in the US it’s 240ml). I can’t check ingredients like chocolate etc. as there isn’t an accurate way to convert them. Bear in mind also that there are variations in cup measurements for dry ingredients (flour measured in cups can have wildly different amounts, for example whether you dip the cup into the flour or spoon the flour into the cup will dramatically change the amount of flour that ends up in the cup, and this can in turn dramatically affect the result of the cake). This is the main reason I write recipes in weight measurements, 330g is 330g, no matter how you add it to the scales, or what country you’re in. This makes it easier for me to help readers troubleshoot the recipe if they have issues (if they’ve weighed the ingredients I can pretty much rule out incorrect amounts as the problem). I wish you the best of luck with the cake, but please remember that if you have any problems with the result I won’t be able to help you troubleshoot them as it will be difficult to tell what caused the issue. Hello, I’m interested in making you’re delicious cake with the hazelnut and Frangelico which you mention at the top of the Devils food cake as an option. 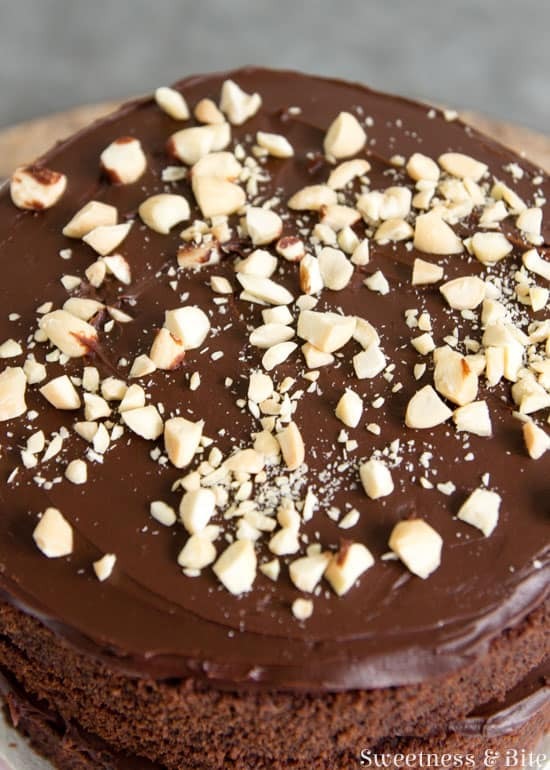 Do you think I should use Almond Choc recipe and just use ground hazelnuts instead of almond meal and Frangelico instead of Amareto or should I use the devils food cake recipe do you think? Also I’m interested in making a two tiered cake with a smaller round on top (I’m planning on covering with white fondant and having small flat fondant balloon shapes cascading up the layers.) Have you got any advise on cooking times and measuring amounts in each tin? Thanks so much! Thank you, you’re a super star! Lederhosen solely had five individuals inside beside the bartender/server. Hello Natalie I have just made the GF Almond and choc cake. Wow it certainly rises well. 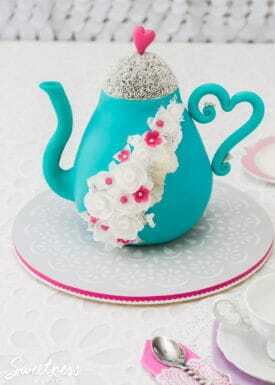 I need to make this in 3 different sizes for a wedding cake. The cake I have just made did shrink even though I did check to see if it was done, but it is so lovely and moist. The bride would like a normal icing like you would put on an old fashioned fruit cake . Would this be ok? How long do you think this would keep once iced?